After a full day at the Alhambra, Lynn and I decided to check out a quaint little restaurant near the hotel. Like most restaurants in Spain, it didn’t open until 8:00 pm. We were at the door at 8:01, and we were the only customers, so we got the prime table at the corner of the dining room overlooking the city. It would have been very romantic, if either of us had been with romantic partners. The server was a woman, one of very few I encountered in Italy, Malta, or Spain. She had a white linen napkin draped over her arm. What’s that for? There were white linen table clothes too; we had landed in another posh place. We were tired and not particularly hungry, but our server was so friendly and attentive we felt we had to give it a try. This was Spain; I don’t eat pork, so it was easy to narrow down my choices. The menu was typical Spanish: Pork cutlets, pasta with pork sausage, ham and potatoes, pork chops, pork tenderloin, Spanish omelet with ham, a vegetarian pasta, and—ta da!—seafood paella. We were assured one dish would be enough for us both. Too late, I remembered from one of my Spanish classes, where we had studied Spanish foods, that paella takes at least 45 minutes to prepare. So we drank a bottle of red wine and tried to keep our heads from lolling off to the side as we got drowsier. The server kept bringing bread and olives, so we were full by the time the massive paella arrived. Lynn and I looked at each other, that look that says, “Maybe we can dump some of it in our bags so we don’t insult the chef when we can’t eat more than a few mouthfuls?” The server stood nearby, eager to see how we liked one of Spain’s national dishes. In case you’ve never heard of paella, it’s a rice dish prepared in a large skillet, the bottom is meant to get sort of crispy and hard. Sadly, it was hard throughout and the seafood was tiny and dry. Unlike most other servers I’d encountered on this trip who had to be begged and bribed to provide service, our friend kept returning every few minutes to see how we were doing. We smiled and dutifully stuffed ourselves but only managed to consume about a quarter of it. I hope they liked their own cooking because they were going to have a lot of leftovers. We still had tickets for the trolley, so the next day we found one showed our tickets to the driver, who gesticulated wildly and spoke in such rapid Spanish I couldn’t understand a word. He did that thing we all do—kept repeating himself a little louder and with more exaggerated pantomime—but we couldn’t make any sense of it. Finally, looking resigned to something; he stamped our tickets, gave us two different tickets, and waved us to the cars with additional incomprehensible instructions. 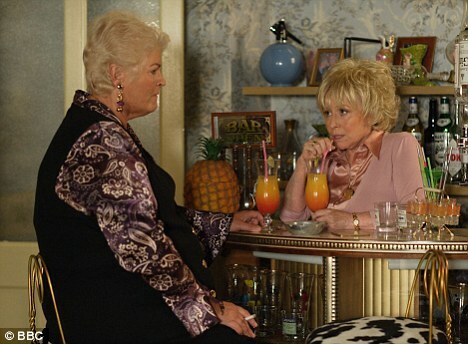 Our car was full of middle aged English women who reminded me of Pat Butcher and Peggy Mitchell from EastEnders. “Gangsters’ wives,” Lynn whispered confidentially. I made small talk and could have spent all day with them, but Lynn kept schtum, probably for fear that if they heard her London accent they would get into who-knows-who and find out they were related. This entry was posted in Adventure, Budget travel, Culture shock, Living abroad, Travel and tagged Granada, Spain, travel on March 1, 2017 by Breaking Free.